Can historical events be revisited? Stories retold? Of course they can, especially as new information comes to light, and we find better ways to bring broader perspectives to the endeavor. Such is the case at Cliveden, a National Trust site and National Historic Landmark (NHL) in Philadelphia’s historic Germantown neighborhood. 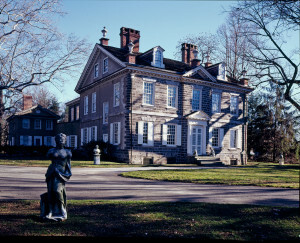 For decades, this summer residence built in 1763-67 by Benjamin Chew, then attorney general of the Province of Pennsylvania, has been recognized in preservation and history circles for its fine Georgian architecture and its role in the 1777 Battle of Germantown. Today, however, that view of Cliveden is being revised and expanded to reflect new research and changing attitudes thanks to three important initiatives. In 2009, the Historical Society of Pennsylvania completed a two-year project processing 300 years of the Chew family papers, one of the most significant holdings in its collection. The documents opened a forgotten window into this family and into the lives of their workers, slaves, and servants, and women in early America. At the same time, the National Trust for Historic Preservation has been engaged in a re-examination of its own historic sites, including Cliveden, as it recognizes that the traditional house museum model may not be sustainable over time. Lastly, the National Park Service for its part is looking to use its National Historic Landmark (NHL) program to capture a broader sweep of the American story. As these initiatives took root, Cliveden found itself in a fortuitous position. The now-accessible Chew family papers offered mountains of information from which to mine a richer, more complete, sometimes harrowing, but honest story of one of the largest slave-holding families in Philadelphia. These newly uncovered stories offer a springboard for community engagement and dialogue, where modern audiences can learn about and struggle with the uncomfortable facts of the past. In 2010, a series of “Cliveden Conversations” brought stakeholders together to offer input and to solicit their reactions. Just as the unearthing of long-forgotten information and new facts drove Cliveden staff to undertake a new interpretive plan, so too did the research provide an opportunity to revisit Cliveden’s NHL nomination. 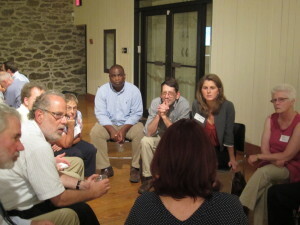 In August, the community was invited to join a conversation and address the question “Do National Historic Landmarks represent our historic values?” The gathering, hosted by Cliveden’s director, David Young, and Jason Allen and Libbie Hawes from the Cliveden staff, included presentations by Bill Bolger, NHL program manager in the Park Service’s Northeast Office, and by a group of University of Michigan students pursuing Ph.D.’s in history, who are revising Cliveden’s NHL nomination. Why the NHL re-write? Libbie Hawes, who provided information and advice to the students, outlined three goals. The first is to expand the public record to embrace the diverse history of Cliveden and align it with Cliveden’s new interpretive plan. Secondly, the student’s work will correct inaccuracies and limitations in the original nomination. Finally, the work at Cliveden will serve as a model for work at other NHLs. Cliveden offers a textbook example of that ignorance. Cliveden was designated an NHL in 1961 when the Chew family was still living in the house. It would be another 11 years before the ownership of Cliveden, its 5.5 acres of parkland, and its collection of artifacts were transferred to the National Trust for Historic Preservation. Prior to 1966, the documentation required for NHL designation was “fairly skimpy,” according to a National Register staff member. With the creation of the National Register of Historic Places through the National Historic Preservation Act of 1966, new documentation requirements were instituted. In 1974 additional documentation for Cliveden, some three pages of text, was submitted to the National Park Service. The documentation focused on two areas of significance—the architecture of the main house and Cliveden’s role in the Battle of Germantown. Today, given the goal of broadening and enriching the story of Cliveden’s national significance, the students’ biggest challenge was articulating everything they wanted to say within the parameters of the NHL document, said their professor, Michelle McClellan. “The students had to learn the conventions of the document,” McClellan said. Yet they pushed this framework to get beyond descriptions of architectural detail or military engagements and to add people to the narrative—the people who used the house as a summer residence and those who took care of it year round. Thus, in a revised NHL document, a description of the service stairs or the kitchen dependency of the house might now include a description of who exactly used those stairs or worked in that kitchen and what the placement of these features says about the relationship of the family members to the people—enslaved and free—who served them. Instead of three pages of text, the 21st-century document could reach 35 to 50 pages, according to their professor. The document is still a work in progress, and the National Historic Landmark Program Office has a continuing role in the document’s development. Decisions have yet to be made about whether the students make a good case for expanding the “period of significance” for Cliveden beyond the time frame of its construction and the year of the Battle of Germantown. With the inclusion of the stories of the enslaved workers of the Chew family, the period might stretch at least to 1780, for example, the date of Pennsylvania’s Act for the Gradual Abolition of Slavery—or beyond. 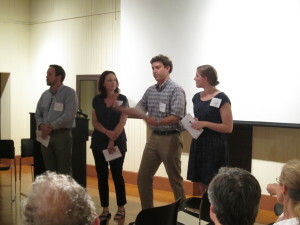 Acknowledgment of the University of Michigan student project team: Jacqueline Antonovich, Joseph Cialdella, Adam Fulton Johnson, Kate Silbert, and Matthew Woodbury. Revising a National Historic Landmark nomination: Should your site undertake it? Timing—Bill Bolger of the NHL program office supports the idea of periodically returning to the NHL document in light of the passage of time and the development of new scholarship or new information. Every ten years is one suggested cycle. Method—Michelle McClellan of the University of Michigan recommends that you get in touch with the NHL program office early in the process and stay in touch throughout, as they are a tremendous help. Scholarship—The NHL nomination document should be approached as a piece of serious scholarship, says McClellan. Students who are candidates for Ph.D.’s are completing the Cliveden work, but sites should recognize that professional consultants are available to do this, too. Resources—David Young of Cliveden reminds us that support for the Cliveden project was made possible through the University of Michigan’s Arts of Citizenship Program and the Eisenberg Institute for Historical Studies. Whether the work is undertaken by students or professional consultants, they should be compensated for their work.